We’d love your help. Let us know what’s wrong with this preview of Ryan Revisited by Sam Davis. When Ryan’s only shot at going to college is on her father’s dime, Ryan leaves Bluffs, Montana to re When you don’t have any idea who you are, how do you decide who you want to be? To ask other readers questions about Ryan Revisited, please sign up. Davis writes a beautiful, lyrical story that grabs you and takes you on a young girl's journey of discovery and heartache. I was bolted to my seat wondering where she was taking me. Don't miss this one if you're looking for something different and a story that truly comes off the pages! I really, really couldn't get into this book. I wanted to, since the description sounded so promising. However, several things killed it for me. Mainly, the protagonist. She was whiny, irritating, and extremely unlikeable. I read the phrase "I don't know who I am" so many times in the first chapter that my head started to heart. College aged kids these days are constantly in the mindset that they need to "find their true self" and "discover themselves", and I agree with this, DNF at 4%...yup, 4%. In theory, I felt like Ryan was going to be a character I'd relate to immensely--I, too, grew up in a place vastly different from where I attended high school and have had identity issues resultantly. However, this book was too dragged out and Ryan's motivations didn't often make sense. In the prologue, Ryan breaks up with Manny, the guy she openly admits has held her together and been a vital part of her high school experience. This action isn't explained. Not once. Not at all. Not even when she In theory, I felt like Ryan was going to be a character I'd relate to immensely--I, too, grew up in a place vastly different from where I attended high school and have had identity issues resultantly. However, this book was too dragged out and Ryan's motivations didn't often make sense. In the prologue, Ryan breaks up with Manny, the guy she openly admits has held her together and been a vital part of her high school experience. This action isn't explained. Not once. Not at all. Not even when she's wishing he loved her still. I don't know if I just missed some vital part of the book, but I really don't get it. This frustrated me throughout the entire book as it simply did not make sense, and to me was a plot flaw the whole way through. Ryan is also obsessed with pleasing her father, and again, this doesn't quite add up for me. She barely mentions her mother or pleasing her--it's only ever her father. She puts part of her motivation for joining a sorority on pleasing her father, but this seems a little extreme. When she was happy in Montana, I don't understand why she felt the need to go to U South. She seems very naive and it disappointed me that when she turned to drinking to solve her problems, none of her friends said anything, and that she wasn't more concerned about her friend Savannah's cycle downwards. The rest of the book was fine, but extremely lengthy--I felt like this was two books of its genre smushed together, and while I normally dislike such duos, this book just felt so long. I got sick of Ryan and I got sick of her sorority and I got sick of her flirting with guys and beginning to drink. The plot that was schemed by a fellow sorority girl was sickening, but did make the story intriguing and put Ryan in a fascinating moral dilemma. The problems that I had with the premise bugged me while I was reading the book the whole way though and were distracting. There were some fun characters like Goody and Geoffrey, and some interesting insights into sorority life and how intense it can be at a big school, but I just felt like it was dragging on. If this book had its premised explained a little better and was cut in half, it would be a very strong book. However, as it stands, it was simply too long to merit itself. While I think Davis has potential, I would recommend other similar books before this one. Ryan doesn't know who she is anymore, she may never have known. Is she Manny's Girl, the Southern Belle her father wants her to be, or a laid back Montana girl? Ryan is determined to find out, to follow the footsteps her father wanted her to, but still be who she thinks she is. Manny and Ryan stayed friends after their breakup and moved to South U despite the awkwardness. Ryan didn't plan on Manny getting a life without her or for herself to get caught up in all that is Greek life. Through drama Ryan doesn't know who she is anymore, she may never have known. Is she Manny's Girl, the Southern Belle her father wants her to be, or a laid back Montana girl? Ryan is determined to find out, to follow the footsteps her father wanted her to, but still be who she thinks she is. Manny and Ryan stayed friends after their breakup and moved to South U despite the awkwardness. Ryan didn't plan on Manny getting a life without her or for herself to get caught up in all that is Greek life. Through drama, tears, fights, good moments, and bad, Ryan finally figures out who she is and what she wants to be. Ryan had always been pulled between the Ryan she wanted to be-carefree and happy, loved and important- and the one she felt like she had to be. Crowd-pleasing and similar, complaint and likable. But I could still see the girl Ryan really was, and she was amazing. Ever watched one of those movies and thought, "Hey that was just a really good movie"? Nothing really jumped out at you to make it spectacular or flashy. Just really good all the way down into your bones and one you felt you could w Ryan had always been pulled between the Ryan she wanted to be-carefree and happy, loved and important- and the one she felt like she had to be. Crowd-pleasing and similar, complaint and likable. Ever watched one of those movies and thought, "Hey that was just a really good movie"? Nothing really jumped out at you to make it spectacular or flashy. Just really good all the way down into your bones and one you felt you could watch over and over just because of how it was and how it made you feel. I am probably blabbering nonsense at you. But that is how I felt about this book. It was just a good read that I would gladly reread one day. Don't get me wrong, it is not an altogether feel good read. Ryan goes through a lot of grief as she is rushing and trying to make herself fit in to the Greek life she thinks will bring her closer to her father. Its like "square peg meet round hole" nearly the whole time. Of course there are the good parts. Like when she meets some amazing friends. But there are the rough ones, too. Those you will just have to read for yourself. I didn't really connect with Ryan and would find myself wanting to smack her for the decisions she was making. But I understood where she was coming from. I knew a lot of those decisions were coming from a place deep within. A place to feel accepted by her dad. She was just going about it the wrong way and losing friends and love in the meantime. RYAN REVISITED is a really good debut for Davis and cannot wait to see what else this author has in store for the future. I definitely recommend if you are looking for a clean, New Adult read. 4 Stars! I am really impressed by this hidden gem. A pager turning story of a young woman trying to find herself. Venturing off to college for the first time, Ryan is trying to impress her father, who has been extremely limited in her life. It’s not her personality to take part in sorority life, but she feels a need to prove herself worthy of his love. However she finds its hard work to appeal to someone who doesn’t care. Ryan is followed by her longtime friend/ ex-boyfriend, Manny, to U South. All Manny I am really impressed by this hidden gem. A pager turning story of a young woman trying to find herself. Venturing off to college for the first time, Ryan is trying to impress her father, who has been extremely limited in her life. It’s not her personality to take part in sorority life, but she feels a need to prove herself worthy of his love. However she finds its hard work to appeal to someone who doesn’t care. Ryan is followed by her longtime friend/ ex-boyfriend, Manny, to U South. All Manny can do is watch as their freshman year of college leads to his love to the path of destruction. Ryan is lead to believe these new girls in her life are all her friend. However, some of them are just really good liars. While it takes not being able to recognize herself in the mirror, Ryan figures out where she messed up, that she wasn’t herself anymore. She had been pretending to be something she wasn’t. Trying to fit in, when she had somewhere she fit perfectly. This book truly gripped my emotions and pulled me in every direction possible before giving me what I needed. Hidden behind a girl finding herself, is a girl in love and that always keeps me wanting more. Sam never failed to let me down and I am so happy I had the chance to meet her and encounter this amazing book. If you have not picked up the book, please do. You’re missing out on such an awesome story that needs to be shared. 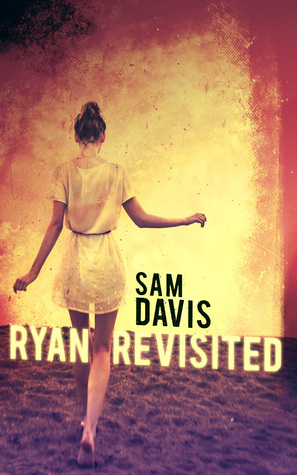 Follow the links below to get you copy of Ryan Revisited by Sam Davis NOW! Ryan breaks up with her amazing boyfriend Manny after receiving a call from her father that causes her to question, well, everything. She doesn’t believe that Manny can love her because, who is she? How can he love someone so lost? They go to college together and try to stay friends (cuz that works) and Ryan goes through a some-what painful, some-what wonderful sorority rush process. in this time she pulls away from Manny, but also tries to keep him close. Ryan is a have her cake and eat it too girl right about now. This is the first book in a long, long time that I had to skip to the prologue just to make it through! I had to know what was going to happen or I was going to absolutely f-ing lose it! I don’t think everyone will have that need, but I did. And it didn’t ruin anything for me, I just needed to see the finish line. Ryan creates bonds of friendships that not only strengthen her as a person, but also test her. I was completely hooked from A to Z. And I firmly believe you will too. Ryan, conflicted about who she is, breaks up with her best friend and boyfriend Manny weeks before high school graduation. Expected to act a certain way by her absent father, she agrees to move back down south and attend college. The problem with that is Manny will also attend that school. All Manny hopes is that Ryan will someday turn back to him and be the girl he knows and not someone her parents want her to be. That would unfortunately take quite some time for her to figure out. Ryan's mai Ryan, conflicted about who she is, breaks up with her best friend and boyfriend Manny weeks before high school graduation. Expected to act a certain way by her absent father, she agrees to move back down south and attend college. The problem with that is Manny will also attend that school. All Manny hopes is that Ryan will someday turn back to him and be the girl he knows and not someone her parents want her to be. That would unfortunately take quite some time for her to figure out. Ryan's main goal is to rush a sorority, even though it feels wrong to her on some level. Ryan was so hard to like. She breaks Manny's heart, but then can't let him go. Ryan goes and gets herself a boyfriend, but Manny is hanging out with a girl and she freaks out. The majority of the people she hung out with were horrible or she treated them badly. I was just hoping she could figure out who and what she wanted before she destroyed herself and everyone around her. Thank goodness for her sorority friends Goody and Morgan to ground her somewhat. It took time to get there, but I was pleased with how it turned out. Ryan needed to deal with her past and abandonment issues before she could look to the future and finally be happy. I can't say enough about Manny. What a wonderful human being with a heart of gold. A book full of frustrations, but worth it in the end. Ryan Revisited by Sam Davis is a beautifully written story. It is written in a way that really shows the depth of characters. It also shows the importance of really knowing yourself. In this story Ryan is facing many issues. Her father has suddenly taken an interest in her after leaving their family when she was 10. He will pay for college as long as she moves back to the South and gets her priorities back and goes back to her roots of being a Southern Belle Débutant. This includes rushing for a Ryan Revisited by Sam Davis is a beautifully written story. It is written in a way that really shows the depth of characters. It also shows the importance of really knowing yourself. In this story Ryan is facing many issues. Her father has suddenly taken an interest in her after leaving their family when she was 10. He will pay for college as long as she moves back to the South and gets her priorities back and goes back to her roots of being a Southern Belle Débutant. This includes rushing for a Sorority. In trying to please everyone and find herself, she pushes away her best friend and Soul mate, Manny. He has followed her to U South on an art scholarship. He refused to interfere with Ryan finding out who she really is, and begins to lead a life without Ryan. There are many twists and turns in this intricately woven plot where Ryan must prove who she really is. She pushes herself full-force into her new duties as a student and sorority member. In attempting to please everyone, including her distant father, she finds she has lost herself again. Will she find the Ryan she wants to be before everything in her life falls completely apart? Ryan had a friend who saw who she was, but Ryan couldn't see it for herself. So she breaks his heart and leaves Montana. She has one shot at University but on her fathers terms, so she leaves to start a fresh in the South - but leaving Manny behind wasn't that easy, he got a scholarship at the same Uni. While Ryan is doing all she can to fit in with the sorority girls, she has doubts to whether this is the right path to follow and along the way she must figure out who she should trust, where her heart belongs and what she really wants for her future. I enjoyed this book, at first I thought Ryan was silly to be constantly wanting approval from others, (hind sight and experience of life I have lived could see easily what she could not) but in essence isn't this what we all do in some form or another? Reading this book I realised that at some point or another we have all felt like Ryan did. I admit I hated school, never knowing where I fitted in, College was not much better, I am still trying lol! I could relate and sympathise with Ryan during her embarrassing moments, cheered for her when she did well and oh Manny, what a keeper that lad is! If you like coming of age stories then you will enjoy reading this book like I did. I recived this novel in exchange for an honest review by romancebeat and netgally. One of the first novel I ever read was a coming of age noel about a young girl who was struggling to get through life and I think Ryan Revisited could be a great novel for a young reader. Through out this novel Ryan is forced to make many hard discussions that make her stand up to those she loves most in her life. Her estranged father suddenly want back in her life after a life time apart from her and is offering t I recived this novel in exchange for an honest review by romancebeat and netgally. One of the first novel I ever read was a coming of age noel about a young girl who was struggling to get through life and I think Ryan Revisited could be a great novel for a young reader. Through out this novel Ryan is forced to make many hard discussions that make her stand up to those she loves most in her life. Her estranged father suddenly want back in her life after a life time apart from her and is offering to pay for her collage fees. But there is one catch, she has to move back to the South and try to enjoy becoming a Southern Belle Debutante. In order to do this she has to join a sorority, become a typical popular collage girl and try not to piss anyone off. Unfortunately when your trying to decide who you are becoming you lose people who care deeply for you along the way and Manny, Ryan's best friend is being left behind without her. How are you suppose to find out who you are if everyone is trying to force you to become who they want you to be. I enjoyed this novel and enjoyed following Ryan's tale as she fights to keep her life from falling around her and hurting those who love her the most. This book was simply amazing. I really do not think my review is going to do this fabulous book justice. The story was about a girl Ryan, who goes off to college to find herself. She has scars left by her absent father that she is trying to heal. She is soul searching, she is answering the question almost everyone ask themselves. "Who am I?" Her Journey is at times very painful, very real, and my heart broke for her over and over again. I don't want to spoil this book for you. But I spent most of This book was simply amazing. I really do not think my review is going to do this fabulous book justice. I don't want to spoil this book for you. But I spent most of my time trying to decide which way I wanted the story to go for Ryan, but even though her journey was lined with tears, it was also beautiful to watch. Ryan really had a heart of gold, even if it took her a round about place to get there. I love so many of the characters in this book, I loved how they were not just perfect on paper, but the characters held flaws that made them each unique and beautiful at the same time. I was lucky to be chosen to receive an arc for this book by Sam Davis. Lucky because it was an enjoyable gift. Ryan Revisited. This book is more than just a love story. It is about friendships and trust. It's about finding one self and believing that what you find is exactly who you are meant to be. It has every complicated relationship that a person could encounter. Sam Davis did a great job of balancing all of the emotions that go along with these complication. The characters are likable. The h I was lucky to be chosen to receive an arc for this book by Sam Davis. Lucky because it was an enjoyable gift. Sam Davis did a great job of balancing all of the emotions that go along with these complication. The characters are likable. The humor in the book, especially if you are a southerner, leaves you smiling. The love she writes is full of angst, creating a dull pain in your chest for it all to be figured out. I related to this book in so many aspects and I think many others will, too. Those that have never been through the "finding myself" phase will enjoy it just the same. Ryan Revisited is an emotional, heartbreaking story that focuses on Ryan, a girl who can't seem to find herself due to a great deal of emotional baggage. But, I'd say her biggest problem is that she didn't realize what was right in front of her face when she broke up with Manny, the boy that saw the real her from the very beginning. Hindsight is always 20/20 though right? And it's easy to give advice to others, but not accept it for yourself. Therefore, it unfortunately takes Ryan quite a long time to finally realize who she is and what she needs, while hurting an awful lot of people along the way. Cue the heartbreak and emotional angst on more than one occasion. Smart, interesting, fantastic character development! I loved this book! This is a book for everyone who loves stories with heart. I really loved the college experience in Ryan Revisited. Especially if you attended a Southern university! The ending is brilliant, too. This story stuck with me. I feel like anyone who reads it will benefit from the personal growth Ryan underwent throughout this journey. I loved just how insightful it is. I think every college student should read it. Like any good book, Smart, interesting, fantastic character development! I loved this book! This is a book for everyone who loves stories with heart. Like any good book, this story has suspense, scandal, and leaves you guessing, too. I couldn't put it down until I found out what how it was all going to end. This is a story about life, about self, about choices, about love, about relationships, about mistakes, about soul. A definite must-read! I want more of these characters! I loved this book! Well-written, and you will fall in love with the characters. You will connect with the emotions and issues Ryan goes through. An INTENSE plot that will keep you reading to figure it all out. I had so many predictions, but the story kept surprising me. And the LOVE story!!! You need to read this book. You won't be disappointed!! Excellent! I couldn't get enough! Want to read a story you can't put down? Want to read a novel you can share with the young adult in your life? Then grab Ryan Revisited! This story will make you laugh, cry and feel good all over. Reading Ryan's story brought back so many memories of my college days and the life choices I made. Beautifully written, this story will warm your heart! Loved it! A must read book about a young woman searching to find out where her place in life is to be. She is torn between her southern roots and her Montana home. Ms. Davis did a good job describing how a young woman at 18/19 would be feeling about life choices. What will Ryan do? Highly recommend for high school to college age woman. If you haven't read Ryan Revisited yet, you are missing out! This is author Sam Davis' first novel but you would never know it. She is a gifted writer. It made me think, it made made me laugh, and it made me cry sad and happy tears. I LOVED it! Don't stop writing Sam! Not my favorite, wasn't even sure I wanted to keep reading at first, but it wound up being a decent story. I can't even remember what this one's about. I think perhaps, I wasn't in the right mood when I started this book. I may try again though.